1. Laird & Co. fedora hat (on Asos); 2. Kioni red coat on Zalando; 3. Missoni dress on Zalando; 4. Philips earphones on Asos; 5. Fun&Basics clutch on Zalando; 6. Marc by Marc Jacobs watch on Asos; 7. Asos Queen cameo necklace; 8. Michael Kors Stella ankle boots, on Zalando. 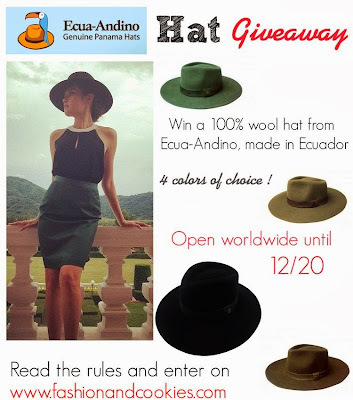 Remember that, thanks to this new worlwide giveaway, a lucky winner can win a wonderful wool Ecua-Andino hat, and pick a color of choice...for a present or just for yourself, this is a super nice gift !. The giveaway is open until December 20th, to read the rules and to enter click here ! Vedo due cose che mi servono e che non ho ancora trovato, il fedora ed il famigerato cappotto rosso. Hai fatto una selezione splendida e adatta un po a tutti i gusti. A me personalmente piace molto l abito Missoni del secondo set. Io adoro ogni singolo capo del secondo set e la pochette del primo. Great post. Looks so simple and clean, love the simplicity in style. comunque utili consigli per una che si riduce sempre all'ultimo! Bellissimi questi suggerimenti, soprattutto il secondo set, anche se mi ridurrò a comprare tutto per me ahahah!!! Un bacio grande cara! My fav is the necklace!! ottime idee, ho un debole per i paraorecchie! Che belle idee! Cappotto rosso e cappello i miei preferiti! Mi piacciono molto il braccialetto e la clutch burgundy! che meraviglia! la collana n. 7 poi è stupenda! Voglio quello stupendo cappotto rosso!!!! bellissimi la trousse e il bracciale! Bellissime idee per i regali di Natale. Del primo set vorrei 2, 4, 8! Bellissime idee e per me che sono sempre in panico quando devo comprare dei regali, sei davvero di aiuto! I agree, dear Vale ♥, of this cause I mostly buy my presents by my own and my lovely husband "gives" them to me :) And now after watching your wonderful wishlists I know a few more things which I really would like to find under the Christmas tree ... and as I know that my husband likes you really I will attract him once more to your blog :) Thank you! I would love to get my hands on #5 from the first set and #1 and #6 from the second set for sure. Come enter the Amy. O necklace giveaway on the Muse! che belle cose hai selezionato!! !